"Extraordinary," "poetic," and "inspired" are only a few words that have been used to describe the food at Chez Panisse. Since the first meal served there in 1971, Alice Waters's Berkeley, California, restaurant has revolutionized American cooking, earning its place among the truly great restaurants of the world. Renowned for the brilliant innovations of its ever-changing menu, Chez Panisse has also come to represent a culinary philosophy inspired by nature — dedicated to the common interest of environment and consumer in the use of gloriously fresh organic ingredients. In Chez Panisse Cooking, chef Paul Bertolli — one of the most talented chefs ever to work with Alice Waters — presents the Chez Panisse kitchen's explorations and reexaminations of earlier triumphs. Expanding upon — and sometimes simplifying — the concepts that have made Chez Panisse legendary, Bertolli provides reflections, recipes, and menus that lead the cook to a critical and intuitive understanding of food itself, of its purest organic sources and most sublime uses. Perhaps best described by Richard Olney, "Paul Bertolli's cuisine is what 'health food' should be and never is: a celebration of purity. The food is imaginative but never complicated; it is art." Enhanced by Gail Skoff's breathtaking hand-colored photographs, Paul Bertolli's recipes remind us of the simple and passionate joys in cooking and of the inspiration to be drawn from each season's freshest foods: glistening local salmon creates a wildly colorful springtime carpaccio or is grilled later in the season with tomatoes and basil vinaigrette; autumn's fresh white truffles are sliced into an extraordinarily textured salad of pastel hues with fennel, mushrooms, and Parmesan cheese; figs left on the tree until they grow heavy and sweet appear in a fall fruit salad with warm goat cheese and herb toast. Many of these recipes reflect Paul Bertolli's love of northern Italian food; for other dishes, the inspiration is French; in all, there is a keen awareness of the abundance of uncompromisingly pure, seasonal ingredients to be found in America. 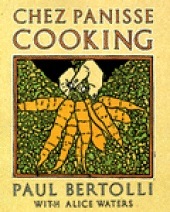 Above all, the Chez Panisse recipes are meant to inspire the cook to create his or her own version; to awaken the senses to the nuances of taste, texture, and color in cooking; to "discover the ecstatic moments when the intuition, skill, and accumulated experience of the cook merge with the taste and composition of the food." Since its original publication in 1988, this classic cookbook has proved to be indispensable to the shelf of every serious cook and every serious cookbook reader.